In examining the implications for an exit from a currency union, one of the issues that arises is the proportion of public debt that is issued under foreign law. This is a separate issue to the implications of foreign-currency denominated debt. Both issues are problematic and compromise a government’s capacity to remain solvent. I covered the former issue to some extent in my 2015 book – Eurozone Dystopia: Groupthink and Denial on a Grand Scale – when I was considering different strategies for exit. There has been some further research on the question of foreign law debt issuance by the ECB and its Working Paper No. 2162 – Foreign-law bonds: can they reduce sovereign borrowing costs? – published June 2018, has relevance. It is clear that a government reestablishing its sovereignty has the upper hand, especially if it has issued debt under its own legal system. Which is why the likes of the IMF and the European Commission has been keen to increasingly pressure governments to issue debt under foreign laws under the ruse that this is a show of faith to the private bond markets. Once again the increasing bias towards foreign-law debt is all about privileging private capital over the interests of citizens in national states. What is absolutely clear is that a sovereign government should never issue debt instruments under any legal system other than their own. What is even clearer – such a government has no need to issue any debt at all. The first point to note is that a sovereign government, one which issues its own currency, should never issue debt in any form. There is no financial reason to do so. If such a government does issue debt then it should only ever be denominated in its own currency and constituted under the nation’s own legal structure. In those situations there can never be any question of solvency – such a government can always meet any financial liabilities that are denominated in the currency it issues. Any deviation from that state would only arise if the government imposed voluntary restrictions on itself or chose to default for political reasons. The situation is different for a government that does not issue its own currency, such as the 19 Member States of the Eurozone. They must issue debt to cover any spending in excess of taxation receipts. In that respect, they are captive of the private bond markets and must pay the yields that are demanded at the time of issue. In the case of the Eurozone, the European Central Bank can clearly play a role in controlling those yields if it chooses. Its Quantitative Easing program has done just that. The only problem in the EMU context is that the ECB will only exercise that function if nation’s follow the strict fiscal austerity rules. In the case of the Eurozone Member States they are always forced to issue debt in a foreign currency and are thus always exposed to the risk of insolvency. Then the question arises – which legal jurisdiction should they issue the debt contract in? The 19 Member States still have a choice in that regard. They can issue the foreign-currency denominated debt under their own law or under the law of another country. This is a different issue to the actual currency the debt that is issued is denominated in. A related (non)-issue is the nationality of the holder of the debt. This is the ‘China is funding the US’ issue, which rears its nonsensical head every now and then. Per se, it doesn’t really matter who holds the debt issued by a government. China is never ‘funding’ US government spending, notwithstanding the fact that Chinese residents (institutions) hold large swathes of US Treasury-issued debt. For a currency-issuing government such as the US, the funds associated with the debt issuance do not provide the US government with the capacity to spend. That capacity is intrinsic to a currency-issuing government. There are exchange rate implications of China running external surpluses against the US and thus accumulating financial claims in US dollars, some of which can manifest as US government bonds. But these issues are separate from the solvency-type issues. 2. Trade and finance mysteries – Part 2 (May 9, 2018). 3. A surplus of trade discussions (May 23, 2018). Further, many commentators claim the only reason the Japanese government has been able to avoid insolvency is that its debt is bought by domestic residents and institutions who have some cultural loyalty or some such. The argument is ridiculous. Yes, the fact that domestic residents and institutions in Japan gain the risk-free asset and income flow, even though yields are typically very low. That might appear to be preferable for some to handing out public money to foreigners. But it has no implications for government solvency. The Japanese government will always be solvent. Yes, I know about the claim that Japan defaulted on its debt as World War 2 was unfolding – this was a strategic act on debt owed to its then new enemies. It has no relevance for serious considerations of solvency. 1. The currency of denomination. 2. The nationality of the holder of the debt – foreign or domestic. 3. The legislative framework and the place of issuance, which regulates the debt contract. The ECB Working Paper cited in the Introduction (published June 2018), bears on the third dimension identified above – the jurisdiction which regulates the debt contract. Their research seeks to whether there are “pricing effects of this jurisdiction choice”. From the investors’ perspective, sovereign bonds governed by the laws of a foreign jurisdiction are less risky than domestic-law bonds. Domestic-law bonds can have weaker legal protection since the bond contract terms can be altered retroactively by changes in the law of debtor countries. Through an act of parliament, governments can, in principle, change the payment terms of domestic-law bonds, their currency denomination, or the voting rules for a potential restructuring. Such a retroactive change of contracts is not possible for foreign-law bonds, because legislation by national parliaments has no authority beyond domestic borders. I examined this issue in my 2015 book – Eurozone Dystopia: Groupthink and Denial on a Grand Scale – in my discussion of the so-called ‘Law of the Money’ or Lex Monetae. Lex Monetae or ‘The Law of the Money’ is a well-established legal principle, backed up by a swathe of case law across many jurisdictions, and is internationally accepted. It states broadly that the government of the day determines what the legal currency is for transactions and contractual obligations within its national borders. There is thus no question that a nation currently using the euro could abandon it, introduce its own currency, and require all taxes to be paid and all contracts to be denominated in that currency. Lex Monetae also has been taken to mean that if, say, an Italian had borrowed US dollars from a London bank operating under English law, the definition of the ‘currency’ for the purposes of resolving this contract is governed by US law. Finally, the principle also means that if a government changes its currency and re-denominates at some given parity, all contracts must be honoured at the re-denominated rate. The legal principle became the topic of financial commentary in 2012, when there was the very real possibility that Greece would be forced out of the Eurozone. On May 20, 2012, the UK Telegraph published the article – Multinationals sweep euros from accounts on daily basis – which elaborated on the implications of the legal principle. The principle is a legal minefield when it comes to the euro because economic monetary union compelled all member states to transfer “irrevocably” monetary sovereignty to the European Union. If Athens quit the euro, however, Greek companies would be expected to claim that they could honour any obligations in a depreciating drachma – a stance local courts are likely to back. Much would then depend on the legal jurisdiction of any contract as to whether it was actually enforceable. So there is an interpretation of the legal principle that says that even private sector debtors can demand to have any obligations redenominated in the currency of the nation they operate in. This is serious implications for whether an exiting government introduces legislation to permit this and which jurisdiction the issue would be settled in. While there is little doubt that a government could redenominate any debt it issued under its own legal framework in the currency of their choosing, the uncertainty surrounding private debt has meant that some commentators, say in the case of an EMU Member State exiting the currency arrangement, advocating that all private financial contracts remain in euros (including all bank deposits). There is no clear legal precedent to guide us in this specific case. It is really a secondary consideration for the exiting government. They could choose either option – leave all private financial contracts in euros or force redenomination at some parity or both. Ultimately, taxpayers in the exiting nation would have to acquire the new currency immediately to meet their obligations to the state (which would no longer accept euros in this regard) and the only way they could do that would be to swap goods and services in return for the currency (which the government would have had to spend into existence) or engage in foreign exchange market transactions. As some point, when GDP was growing strongly enough, everyone would want to shift into the new currency anyway. Consideration of Lex Monetae has led to a new concept – redenomination risk – entering the financial lexicon. This obviously is a major issue if any Eurozone Member State makes the decision to exit. In the case of a nation that changes its own currency, which then might depreciate against other currencies, the redenomination risk is present but there can be no question that the ‘old’ currency continues to exist. In the Eurozone case, if Italy was to exit and introduce its own currency the euro still exists. So there is a question of which ‘Lex Monetae’ is relevant – that of the remaining euro Member States or that of Italy. Working through the implications of that distinction is interesting. And the jurisdictional status of the debt contracts then becomes a significant factor in deciding between the two options. As the ECB Working Paper notes, it is relatively straightforward for a government to redenominate its outstanding liabilities into the currency of its choice if the contracts (debt agreements) are made under the law of that nation. The only question is the redenomination parity (1 for 1, or something else). The redenomination risk arises though in terms of that parity (at the time of redenomination) and then subsequently, when the new currency trades on international foreign exchange markets. The latter risk is really a foreign exchange risk that exists every time currency transactions are present but in this case it is driven not by the choice of the currency holder but by the redenomination choice of the government. … because legislation by national parliaments has no authority beyond domestic borders. We saw that distinction in operation during the 2012 Greek debt restructuring. In early 2012, the Greek parliament passed a law inserting clauses into the outstanding Greek domestic- law bonds that made an encompassing debt restructuring significantly easier. In contrast, the outstanding Greek foreign-law bonds were not affected. The law the ECB was referring to demonstrated the additional complication of so-called Collective Action Clauses (CACs). These arrangements allows some majority of creditors to make agreements among themselves which are then binding on other creditors in the case of a debt restructure or redenomination. CACs became a big deal in the 2012 Greek Bailout. The Greek government was coerced by the IMF and the ECB into amending Greek law on February 23, 2012 with the following legislation – Greek law no. 4050/2012 “Rules of amendment of titles issued or guaranteed by the Hellenic Republic with the Bondholder’s agreement, otherwise known as the “Greek Bondholder Act”. This Act retrospectively added CACs to all outstanding Greek government debt issued under Greek law. This forced all creditors to accept the decisions of a majority (66 per cent) of creditors to take the ‘haircut’ under the so-called Private Sector Involvement’ (PSI), irrespective of whether those minority creditors had signalled a willingness or otherwise to accept the deal presented to them by the Troika. The inclusion of the CACs allowed the Troika to trample over the rights of creditors who had purchased the debt in good faith. It was one of many astounding features of that period of European financial history. The ECB note that “more than 50% OF Greek bonds under English, Swiss and Japanese law were not restructured and have been serviced in full and on time ever since. The foreign-law clause thus protected these investors from deep losses”. The losses on “domestic-law bonds” was of the order of 65 per centr of the net present value of the debt and income streams. The willingness of governments to retrospectively use CACs when they get into financial trouble has risen in recent years because it is perceived they add a layer of protection to the issuing body. The rising importance of CACs also reflects a view that they can deal with the ‘free rider’ or holdout problem. However, things are not that simple. History tells us that the use of CACs has been far from clean and have not offered speedy resolutions. Legal covenants have always considered creditors to have individual rights and this requires that any restructuring entity negotiate one by one. If one or more creditors refuse the terms of the restructure then this puts a spanner in the works. Lawyers typically benefit from the legal challenges that follow and delays in settlements (enforcing the CACs) are common. This IMF Policy Paper – A Survey of Experiences in Emerging Market Sovereign Debt Restructurings (published June 5, 2012) – illustrates the complexity of restructuring when CACs are involved. Two notable cases (Argentina, 2005; and Dominica, 2004) “had a large share of holdout creditors and difficulties in re-accessing international capital markets after the exchange”. In the case of Argentina (2005) it took 42 months to engineer a 76.30 per cent haircut after the CACs were triggered to deal with a holdout group comprising 24 per cent of creditors. In Dominica (2004) it took 15 months to engineer a 54 per cent haircut after the CACs were triggered to deal with a holdout group comprising 28 per cent of creditors. So, having CACs is no guarantee that a nation will be able to avoid protracted litigation. Which is why debt that is issued under rules of foreign legal jurisdictions is seen as being safer for ‘investors’ and gives government little leeway. This point was not lost on the Troika, which during the 2012 bailout forced the Greek government to issue liabilities under English law in order to gain further bailout assistance, thus anticipating the application of Lex Monetae, in the case of an exit. What proportion of debt is issued under foreign laws? The following graphic comes from the ECB Working Paper (cited above) and shows “the share of foreign-law bonds in total public sector bond issuance between 2003 and July 2014 for EU countries”. The ECB Working Paper also published a similar graph for Emerging Market Economies (EMEs) which included Argentina, China, India, Malaysia, Mexico, Philippines, Russia, Singapore, South Korea, Turkey and UAE. 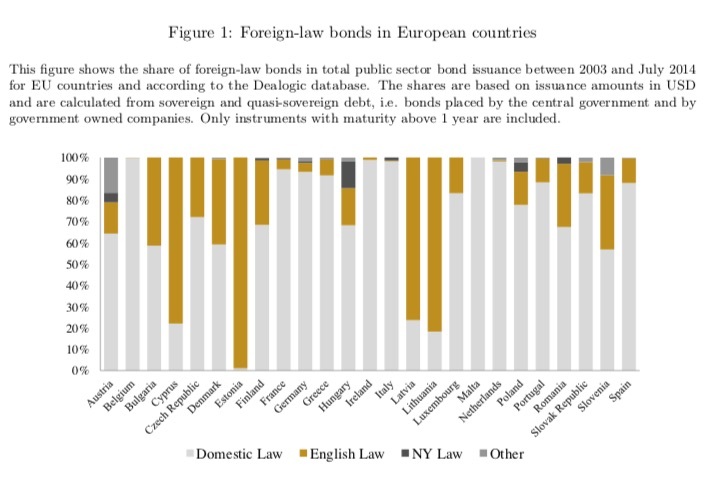 We generally find foreign-law bonds to account for a substantial share of public sector borrowing in the last decade, both in Europe and in Emerging Markets. Why would governments forego their options under Lex Monetae and issue debt under foreign law? … after the Greek experience, investors might think twice before investing in those local-law bonds, no matter how high the yield. Foreign-law bonds can also be more attractive to foreign investors because they allow bondholders to pursue legal action away from local courts, which are unlikely to look with favor on foreign investor claims. My reading of the legal and financial literature, however, is that a government that reestablishes its sovereignty can simply ignore legal claims against it in foreign courts. The findings are consistent with the view that issuing foreign-law bonds provides the possibility of commitment in crisis times: by issuing under foreign jurisdictions and thereby making the debt harder to restructure, sovereigns send a signal that they are unlikely to default on such bonds. That seems to leave the volition with the national government. But in practice, especially in poorer nations in Africa and Latin America, the IMF has coerced the governments into issuing debt under foreign law contracts to make it harder for the governments to restructure when in trouble and make the austerity adjustments more binding. History suggests that motivation rather than the desire of governments to show bond markets they are committed to repayment is the reason for the rising importance of foreign-law debt issuance. I am currently working on a number of these issues to more fully educate myself in the murky world of sovereign debt law. The purpose of this self-education is to allow me to more carefully develop an Exit Blueprint for nations stuck in anti-democratic and destructive arrangements such as the Eurozone. It is clear that a government reestablishing its sovereignty has the upper hand, especially if it has issued debt under its own legal system. Which is why the likes of the IMF and the European Commission has been keen to increasingly pressure governments to issue debt under foreign laws under the ruse that this is a show of faith to the private bond markets. Once again the increasing bias towards foreign-law debt is all about privileging private capital over the interests of citizens in national states. What is absolutely clear is that a sovereign government should never issue debt instruments under any legal system other than their own. What is even clearer – such a government has no need to issue any debt at all. It appears that English law is a very common choice for debt issued under foreign law. Would this imply that a British government (say, led by Corbyn) could legislate to allow other countries who issued debts under English law to re-denominate in their domestic currency, should they wish to? I certainly agree about the reasons why debt shouldn’t be issued under foreign law at all. I just thought changing UK legislation might offer a solution for the existing stock of foreign currency denominated debt issued under English law. Warren when interviewed suggested you don’t actually leave the Euro and just start taxing in the Lira on a 1:1 basis. Then start spending in the Lira. This gives the Italians independent fiscal policy and independent monetary policy. He then says the most important thing is not to covert bank deposits from Euro to Lira. So say half the people in Italy want the Euro and the other half need the lira to make ends meet. If you convert everybody to Lira now those people who want Euro are very unhappy. So they have this Lira that they don’t want and what they do is sell the Lira to by the Euro. The Lira can then drop 60% and the central bank does not know what to do ( there’s a suprise) so they raise interest rates which pushes the price of imports up by 50% or more and then the government does not know how to deal with that ( there’s another suprise) then the government collapses. On the other hand if you don’t convert bank deposits everybody is happy. The people who have Euro who want the Lira. Have to sell their Euro’s and buy the Lira. Where are they going to get the Lira from as it is the new currency ? The government can sell them the new Lira at a slight premium to the Euro say 1%. So now people can sell the Euro and get the Lira they want which creates a strong stable currency that does not go down. It wan’t to go up but the government sells it keeping in constant. Which means the government is getting all of these Euro’s for people who want Lira. It uses that to pay off its Lira debt that helps it to get through the difficult transistion period without a collapse in currency. So it is important that you don’t force everybody to convert from Euro to Lira. All Bank Deposits including central bank deposits. You do not convert the Italian bonds. They stay in Euro. What I take away from that is in order to sell the Lira and drop the currency and then collapse the government. They have to have the Lira to do that. Warren’s proposal stops that as there are few Lira about and to get the Lira in the first place to sell it you have to first sell the Euro to get the Lira which keeps the Lira stronger. Derek, do you have the link available? Yup: Milton Friedman and Warren Mosler also argued against debt in any form. What always makes the situation worse is the first line of defence of raising interest rates to protect the currency. For me that is a HUGE mistake and only makes things worse. Raising interest rates do the exact opposite of what they say they will do. It looks like the right move at the time because Mr Market moves to protect the currency as the market participants are moving it under a false understanding. Ultimately, it is short lived as the price hikes and the interest income channels will further weaken the currency. If however, the first response was to slash interest rates to zero to defend the currency. Fundamentally that would work over the longer term. The problem being the short term reaction by Mr Market and the market participants would be the opposite they would continue to sell the currency under a false understanding. So I like Warren’s proposals because you could actually cut interest rates to zero whilst carrying out what he suggests and I think that would defend the currency easily over the short and longer term. The Eurozone Hotel – the only hotel where they lock you in your room for your own ‘safety’…..